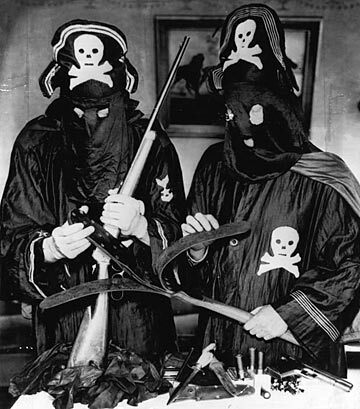 Black Legion members in the 1930s. I'm in the midst of researching a mystery novel set in Detroit in 1935 and the more I read, I realize the city hasn't changed that much. The backdrop for the book is the formation of the UAW and the Ford Hunger march of 1932 in which five workers were killed by Ford Motor Co. goons and Dearborn police. I know that wouldn't happen these days, but one issue that hasn't is the right-to-work. The state legislature not long ago made Michigan a right-to-work state, reheating an old issue. Also figuring in the book is the Black Legion, which was very active in Detroit in the early 1930s. It was an offshoot of the KKK and was anti-communist, anti-immigrant and opposed to unions. There's some indication it was used by manufacturers in Detroit to fight unionization, but that comes from a booklet published by a socialist group, and I wonder how much of it is true. The group was responsible for some killings in Michigan and eventually was brought down by police. While the legion is history and I doubt we'll ever see its likes again, we still have that "anti" sentiment alive among some ultra conservatives. Don't get me wrong, I very much respect the conservative point view. We need to hear it for balance. You can't turn on the radio or TV these days without hearing some bellowing blow hard trying to put his or her political spin on events. Personally, I don't like either side. Things weren't much different in the early 1930s. Detroit had it's own conservative talk show host in the person of Rev. Charles Coglin, a priest at the Shrine of the Little Flower in Royal Oak. His anti-communist tirades and conservative positions had a large nationwide audience and it took the Catholic Church to eventually silence him. Meanwhile, at Detroit's city hall corruption was common place with the Purple Gang paying off police and public officials. Just look at the headlines coming out of Detroit these days, and you realize somethings don't change. It's just a different set of characters.